Dennis White knew he was going to die soon, and he had a plan. The 63-year old Massachusetts man had a disease called progressive primary aphasia — a condition that slowly robbed him of cognitive function and made it difficult for him to speak. In planning his own funeral, he had seen a TED Talk by artist Jae Rhim Lee about her idea for a mushroom burial suit, and realized it was for him. White had his death planning process filmed and turned into a short documentary. The Infinity Suit he chose is a hand-sewn shroud made of mushroom spores and other microorganisms that are supposed to aid in decomposition and neutralize toxins, according to Coeio, the company that makes the garment (which costs $1500). The suit is designed to wrap a body without a casket for green burial, but Coeio also makes a shroud, a casket liner, and a variety of pet burial products. Lee used her own skin, nails, and hair to “feed” to different mushroom strains, eventually choosing the ones that performed the best. The company has continued testing each step of the way, and is currently investigating long-term effects of suit burial on soil health. People are now rethinking relationships with death and burials, from the ground up. It’s part of a movement that reimagines humans’ relationship with the earth, says Suzanne Kelly, author of "Greening Death: Reclaiming Burial Practices and Our Tie to the Earth." Kelly points out that before the 1830s, people celebrated and buried their dead without caskets, embalming or vaults, on family farms or in church graveyards. But a rise of urbanism collided with a fear of sanitation. “It was believed that if something smelled bad, it would make you sick,” Kelly says. Reformers set their sights on cemeteries and banned them from town centers. Slowly, people became more distanced from dead bodies. Today, the way we manage the dead isn’t sustainable. Each year, 2.6 million people die in the United States, and most are buried in a cemetery or cremated, impacting land use and contributing to climate change. These threads to show how mushroom mycelium may spread out below ground as the body decomposes. Courtesy of Coeio. By 2030, Kelly estimates that 70 percent of dead bodies will be cremated nationwide. Some choose it for the lower cost, while others choose cremation for environmental reasons. A Scottish company called Resomation is offering a new way to cremate: using alkaline hydrolysis, also known as water cremation. In the process, a body is placed in a silk bag and loaded into a machine filled with a mixture of water and potassium hydroxide, set to 356 degrees Fahrenheit. The chemicals and temperature break down the body into its chemical components. In 3-4 hours, a family gets back bone ash (similar to traditional cremation using fire) — and the company says the machine uses only 1/8 of the energy required for cremation and doesn’t emit mercury into the air. For those who want even more to become part of the earth, the Urban Death Project is working on its first prototype for its "Recomposition Core" that will return human nutrients to the ground. Designer Katrina Spade created the idea for a several-storied building, within city limits, in which a collective pile of bodies can compost over time and ultimately be used as fertilizer. The idea was based on the way farmers compost livestock bodies on farms: Just put nitrogen-rich material, like dead animals, inside a mound of carbon-rich material, like wood chips and sawdust, add moisture or extra nitrogen and make other adjustments as needed. Microbes and bacteria do the rest of the work, breaking tissue and bone down to component parts as the pile heats up. The heat also kills pathogens. Spade says that the verticality lends itself to a framework for ritual: “The living carry loved ones up a ramp, and lay them into the wood chips,” she says. “As the body is transformed, it moves downward into the core. The living take their energy to start the bodies of the dead to give new energy through the composted soil.” Weeks or months later, a family could return to take home some of the composted soil. Spade points out that the business model of cemeteries just isn’t sustainable, on many levels. 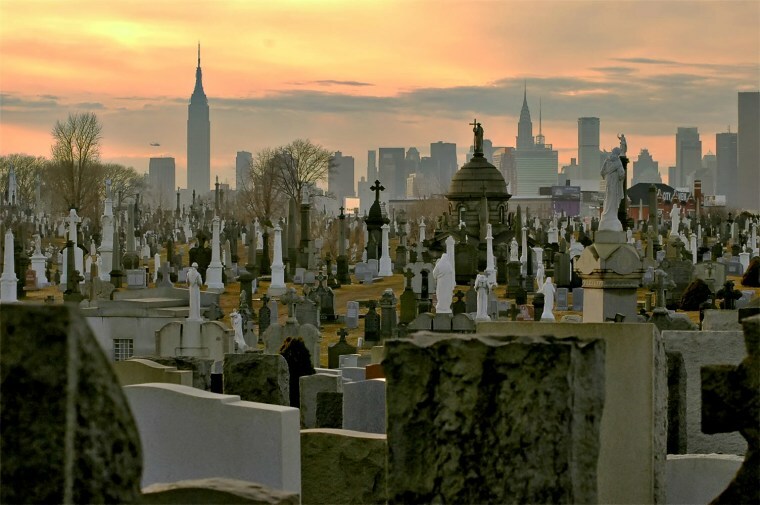 In addition to cities like New York, which have simply run out of room to bury bodies, it is not a very good long-term business plan to sell someone land for eternity. She hopes that in the future, there will be a dozen options for people to choose from — not just burial or cremation. There is also a movement of home funerals, where families host their own celebrations and are involved in the hands-on management of the body. Much like the surge in popularity for home births, these arrangements try to bring a comfortable and intimate setting to grieving families, and are often presided over by celebrants (also known as death midwives) who guide the process of washing and wrapping a body. When rural cemeteries first started cropping up after many towns passed bans on burials, they became places that the living would come to remember and celebrate. As Kelly points out, the first rural cemeteries also hosted weddings, parties, and picnics. “Rural cemeteries were our first parks in the U.S., and they gave rise to the parks we love — Central Park took cues from the rural cemeteries,” she says. Some modern conservation burial grounds are returning to that idea. In 1998, the first green cemetery in the U.S. opened at Ramsey Creek, with the idea of using burials as a way to protect and restore the land. Green cemeteries require that interments must be natural burials without toxic embalming fluids, no vaults, and only biodegradable caskets. “Tying human death to conservation is a great marriage, and in fact not only cares for the living and the dead, but also the land,” Kelly says. Increasingly, people are returning to conservation burial grounds to use the land in other ways, too — for recreation. Kelly even saw a wedding occurring at a green cemetery she visited a few years ago. For more of the breakthroughs changing our lives, follow NBC MACH.